The entrance from the elevators was built to resemble a stadium entrance tunnel. 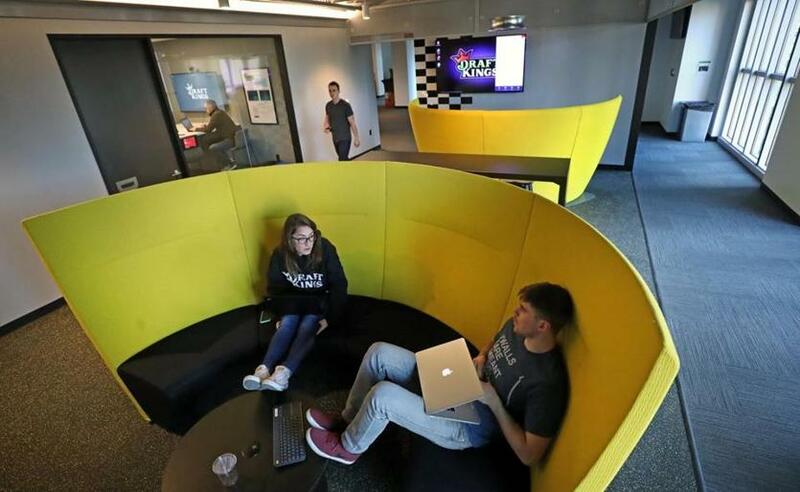 The employee dining area at DraftKings’ new Back Bay office is modeled after a football field. It even has yard lines painted on the polished concrete floor, under a gridiron-shaped rack of color-shifting LED lights. The elevator bank looks like the entrance tunnel to a sports arena, and a hockey-themed meeting area features protective glass from hockey venues on the walls. The fantasy sports provider, which was scheduled to open its new offices in a ceremony with Governor Charlie Baker on Tuesday, is showcasing its role as a growing employer in the field of consumer technology as it prepares for a debate over whether to legalize sports betting in Massachusetts. The so-called NASCAR huddle in DraftKings’ new office on Boylston Street. Baker has proposed a measure that would give operators like DraftKings the ability to run games independently of the state’s licensed casinos. That would be a departure from what other states that have legalized sports betting have done over the past year. Signaling the company’s ambition, 11 small rooms line a corner of the space at 500 Boylston St. These are for interviewing prospective employees, and the company says it’s already using them as it grows from a provider of daily fantasy sports games into a competitor in the growing market for sports betting, as well as a maker of original video and audio content. 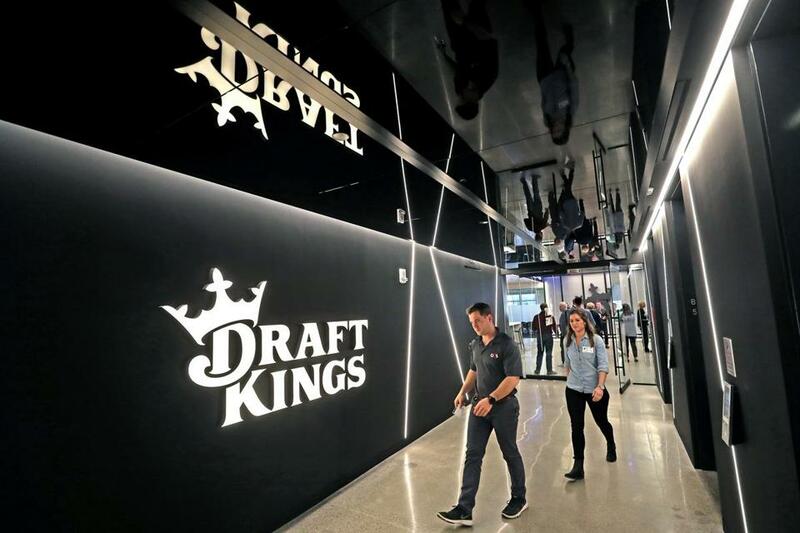 “It’s important to us to bring in the best talent to DraftKings,” said cofounder Matthew Kalish, who noted the company got 40,000 job applications last year and hired 438 people. It now has about 750 employees, 600 of whom are in Boston. Employees moved into the new space March 4, leaving a site on Summer Street where the company had grown to fill five non-adjacent floors. Now, it’s on one massive floor with 105,000 square feet, one of the largest single-floor offices in Boston. 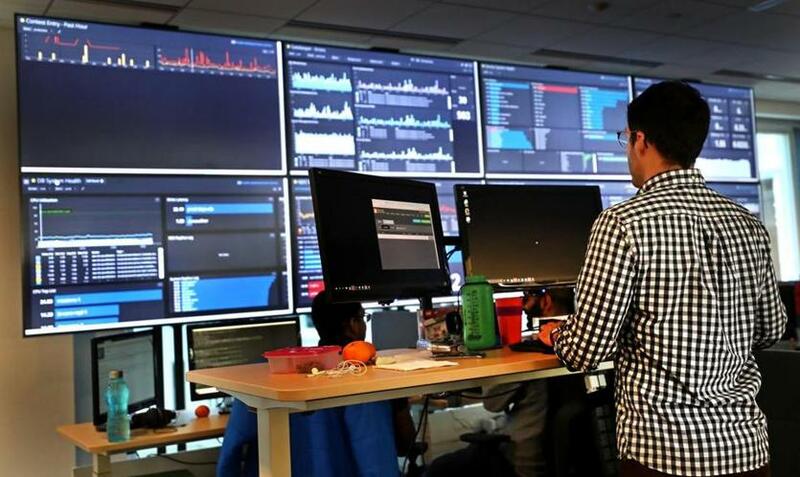 A monitor display in DraftKings’ new office.